Some years they produce copious amounts of nectar during the brief two-week bloom. Occasionally this provides nearby beekeepers with a bumper crop of heavy-bodied, water-white, elegantly flavored honey. In some parts of the Appalachians, locust honey is often called “the beekeepers’ honey” because the locust bloom is very unpredictable, and on the few occasions when beekeepers harvest a crop of this special honey, it rarely makes it to the market because the beekeepers usually squirrel it away for their own use. Locust blossoms are prime for only a week or so, and you best catch them at the beginning of the bloom. If the edges of the petals are dried and wrinkly, you are too late. They are best gathered in the morning, before the bees and butterflies have sipped away their nectar. 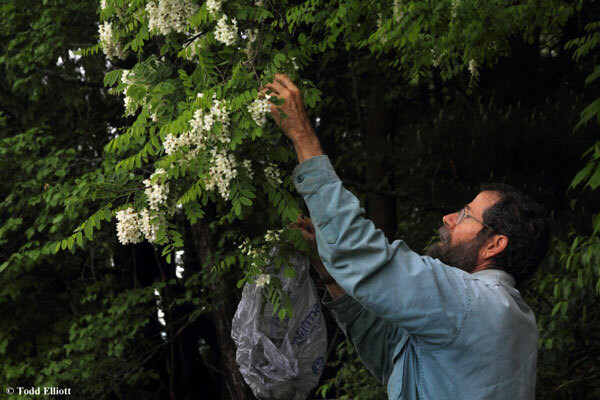 The flowers can be nibbled right off the tree, used as an addition to salads, or dipped into thin pancake batter and fried to make locust blossom fritters. 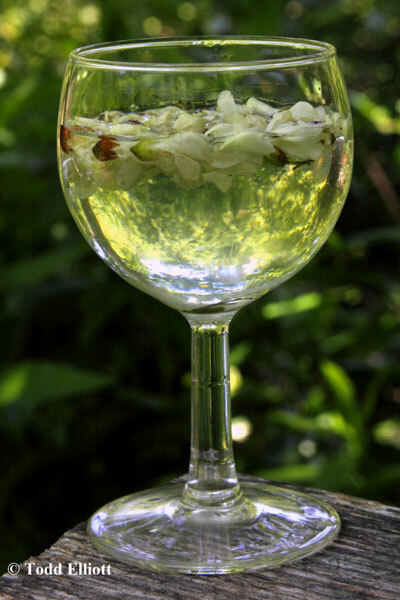 The most elegant use I know for the flowers is locust blossom cordial. To make it, use freshly opened locust blossoms. Loosely fill a container (ideally a glass pitcher) with the flowers and then cover with cool spring water and stir gently. Set the pitcher in a refrigerator or other cool place for about an hour and then serve in wine glasses. Allow a few flowers to spill into each glass as you pour. The drink has a delicate bouquet and the nectar imparts a subtle, distinctive sweetness. One of the benefits of this beverage is that you can drink glass after glass of this cordial and still drive home safely! 196 page, lavishly illustrated hardcover book — There’s lots more about locust trees and many other miracles of nature, including beavers, buzzards, snakes, tulip poplar trees, ginseng, Jack-in-the-pulpits, bats, bees, skunks, and more.